Are you looking for day trips from Frankfurt without spending too much traveling time? Are you having a stop over in Frankfurt but wondering what you could do during the limited stay? Luckily you have many choices. Since I moved to Germany a couple of years ago, I started to understand this country by visiting places near Frankfurt, the city near where I used to live. Almost every weekend I went to a different place in Germany. Gradually I have built up great interests in German language and history. I think travel is a visual way to learn the history of a place. While in Frankfurt you don’t really need to hire a car. There are many tours which offer you unique experience of the Frankfurt and the surrounding area. However you need a car for some of the day trips from Frankfurt. Details are included in the “How to get there”. There are many places you can visit near Frankfurt. Having considered the traveling time, I narrow down the list to include 27 day trips from Frankfurt based on driving time. It takes around one hour to each of these places from Frankfurt. You can also reach some places by public transportation. The other main reason to recommend these places is that they represent different aspects of culture, history and landscapes in this area of Germany. Being the oldest town in the Rheingau, Eltville has several nicknames: Weinstadt (Wine Town), Sektstadt (bubbling Wine Town), Rosenstadt (Rose Town) and since 2006 also Gutenbergstadt. In summer, around 22,000 rose bushes in 350 varieties bloom in Eltville, including many rare and historic roses. Kurfürstliche Burg, the landmark of the city, was built in the first half of the 14th century. There is also an exhibition dedicated to Johannes Gutenberg, the inventor who originated a method of printing from movable type that was used without important change until the 20th century. The best way to get there is by car. The driving time is around 30 minutes and the distance is around 37 kilometres from Frankfurt International Airport. In Rhein upper valley stands out this beautiful castle. it is the birthplace of the famous Johannisberger Rieslings. 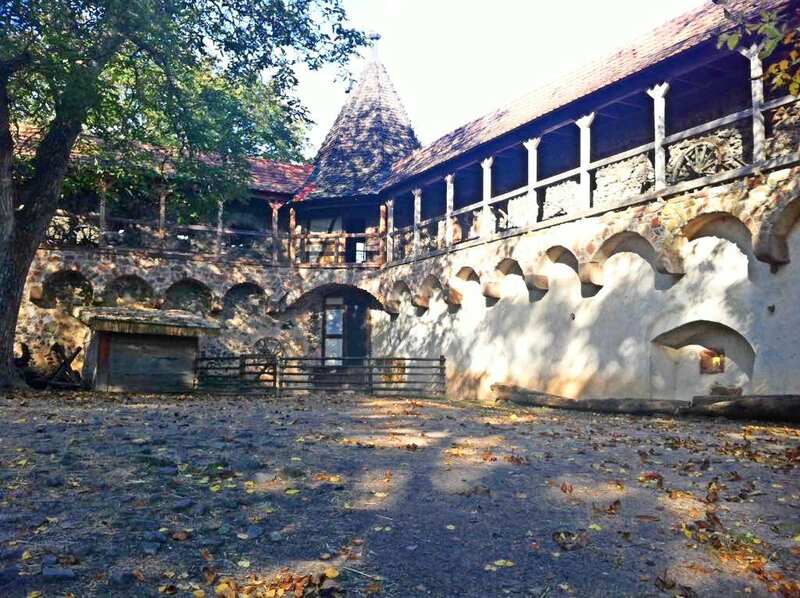 You can book a tour to visit the cellars and have a wine tour of the Schloss Johannisberg. Alternatively you can also take a loop walk through the vineyard with nice views of the surrounding. Beside, various musical events take place in the summer and autumn. The best way to get there is by car. The driving time is around 36 minutes and the distance is about 48 kilometres from Frankfurt International Airport. The destination city is Geisenheim. Rüdesheim is one of top day trips from Frankfurt. It is so popular that most tourists consider it a must. This is a place with rich culture, history and traditions. At the heart of Rüdesheim’s old town visitors can find the charming Drosselgasse. Other famous sites are for example, an excellent wine museum in Brömserburg Castle, the Benedictine Abbey of St. Hildegard etc. This is also a place to produce the premium German spirit Asbach Brandy. There is a cable car which brings visitors to the top of the vineyard. The best way to get there is by car. The driving time is around 38 minutes and the distance is about 52 kilometres from Frankfurt International Airport. There is a wine tasting tour stating from Frankfurt. If you want to experience the German wine tasting this is a good choice for you. This is one of the few almost completely preserved Cistercian monasteries in Europe. The gorgeous old monastery is the main wine producer for the area. But the film “The Name of the Rose” brought it to world attention. 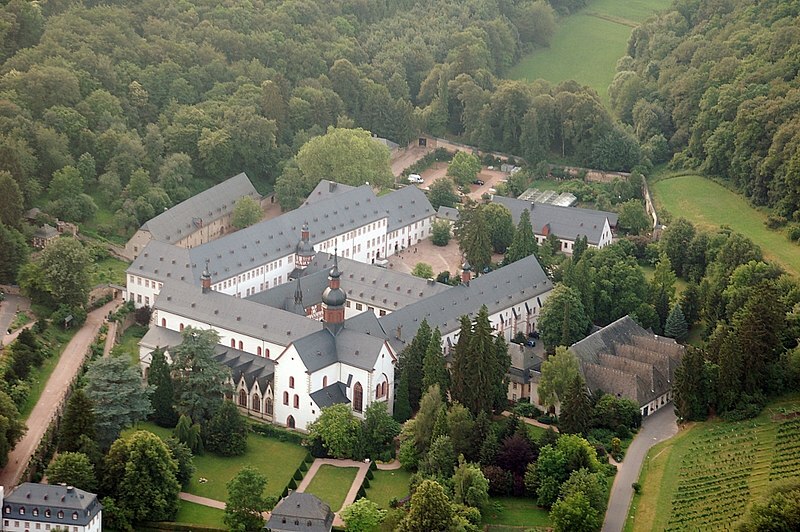 Eberbach Monastery was the location for almost all the interior scenes. It attracts creative minds, artists and producers from all over the world. The best way to get there is by car. The driving time is around 32 minutes and the distance is about 42 kilometres from Frankfurt International Airport. Being a red wine city and one of the top day trips from Frankfurt, Ingelsheim am Rhein is less visited compared to many other German destinations. However it has also a long history and rich wine culture. It has no lack of interesting sights and things to do. There are many activities you could do all year around. The best way to get there is by car. The driving time is around 32 minutes and the distance is about 46 kilometres from Frankfurt International Airport. The alternative to get there is by public transportation S8 at the Airport and then by RB26 at Mainz Central station. archaeological landscape park. The Saalburg Roman Fort is part of UNESCO‘s „Upper-German Raetian Limes“ World Heritage Site. The best way to get there is by car. The driving time is around 25 minutes and the distance is about 35 kilometres from Frankfurt International Airport. The open air museum takes its visitors on a journey of everyday’s life in Hessian villages in the past. 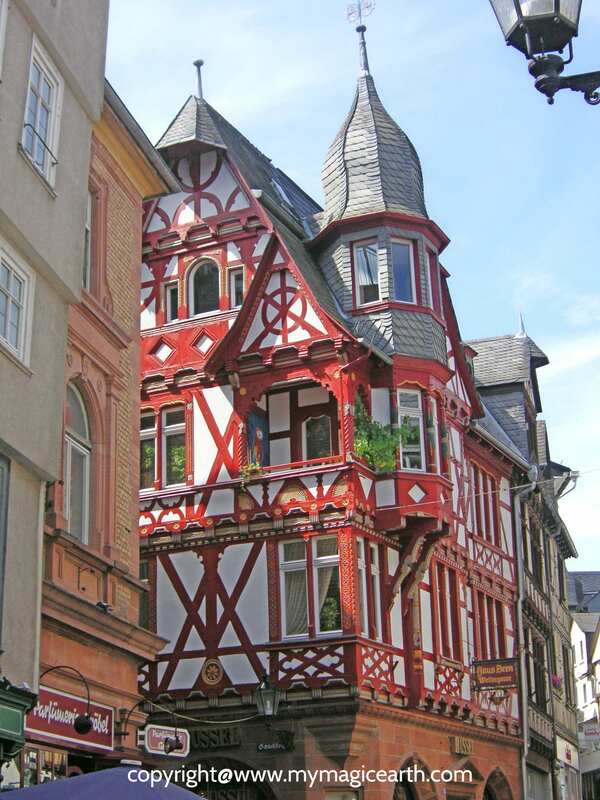 There are many historical half-timbered houses, permanent exhibitions, animals, timeless crafts, and more to discover. It is not open all year round. Check its website before visit. This can be one of the day trips from Frankfurt on a sunny day. The best way to get there is by car. The driving time is around 30 minutes and the distance is about 44 kilometres from Frankfurt International Airport. From the name you probably can guess that this is a German SPA town. Yes, you are right. The first attraction is the graduation houses (“Gradierwerk”) which produces a fresh sea breeze. The salty air also has a positive effect on the organism. Visitors can also take a bath in a historical bath house. But Bad Nauheim is not only a SPA town but also famous for many things. A rose museum, Art nouveau Sprudelhof and historical spa gardens are among the famous sites. It is worth to mention that when Elvis Aaron Presley took up his military service in Germany in 1958, Bad Nauheim became his “European Home“. Visitors can see his room preserved in the original status in the Hotel Grunewald, leave flowers and message at the “Elvis stele”, a column on the Elvis Presley Square, take a picture where it was taken for his album cover of “A Big Hunk o’ Love” or eat the delicious chocolate cake that Elvis enjoyed in Bad Nauheim on his 24th birthday. This is a well-preserved historic town of the Lahn Valley, well-known for its timber-framed architecture. The main attractions include Timber-framed buidings, the Limburger Dom, the Castle of Limburg and the old Lahn bridge etc. The best way to get there is by ICE at the Airport and direct to Limburg. The driving time is around 38 minutes and the distance is about 65 kilometres from Frankfurt International Airport. Marburg is a classic German town with lots of charm and character. It is a small university town north of Frankfurt in the Lahn valley. The main attractions are the castle (“Landgrafenschloss”) on the hill, the university’s historical buildings and the old city (“Oberstadt”, upper city) are the top sights of the city. Simply stroll through the labyrinth of narrow, cobblestone streets lined with extremely well-preserved examples of 17th and 18th century Hessian architecture and many independent shops, you will find yourself hopelessly falling in love with the enticing atmosphere. The best way to get there is by car. The driving time is around one hour and the distance is about 100 kilometres from Frankfurt International Airport. Wetzlar is often called the “city of optics” and is home to manufacturers of microscopes, binoculars, eyeglasses, and cameras. For Leica fan the Leica Adventure World (Leica Erlebniswelt) is a must to visit. Take a walk in the old town. its narrow, winding streets, its houses steeped in history, and the “unfinished” cathedral in the town’s center are just a few examples of the city’s rich historical background. Wetzlar has also an enchanting Landscape. Many forested hills boasts mixed orchards and many hiking trails provide an ideal way to explore the hilly terrain. The best way to get there is by car. The driving time is around 52 minutes via A5 and the distance is about 76 kilometres from Frankfurt International Airport. Bad Dürkheim is a small but important wine-producing town in the north of Germany’s Pfalz wine region. Some of the local wines are sweet and fruity. Visitors can only buy them from the local shops. The most attractive thing to me is however the Dürkheimer Riesenfass (“Giant Barrel”), the world’s biggest barrel. It houses a restaurant. 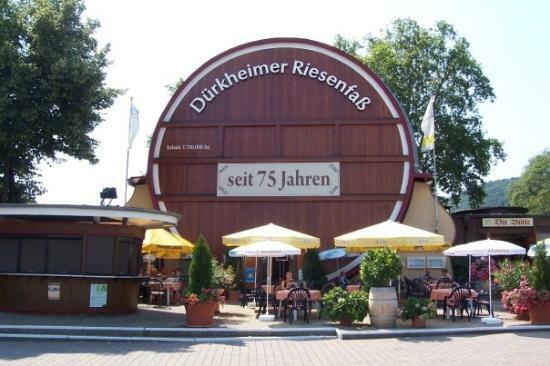 Every year near the Giant Barrel the world biggest wine festival Dürkheimer Wurstmarkt takes place. It is also a spa town with beautiful spa garden and related facilities. The best way to get there is by car. The driving time is around one hour via A67 and the distance is about 96 kilometres from Frankfurt International Airport. Being the the capital and largest city of the state of Rhineland-Palatinate in Germany, it’s known for its old town with half-timbered houses, medieval market squares, the Renaissance Market fountain (Marktbrunnen) and an octagonal tower tops the Romanesque Mainz Cathedral. The Gutenberg Museum honors the inventor of the printing press with exhibits, including 2 of his original bibles. Located in the largest wine-growing region, it is also the wine capital of Germany. It is the perfect base to explore the surrounding of the Rhine river and Main river areas. The best way to get there is to take ICE from Airport. The journey takes about 17 minutes. The driving time is around 26 minutes via A60 and the distance is about 31 kilometres from Frankfurt International Airport. Mainz is a big city. You can book one of the following tours in which aim to different interests. The city is full of elegant old buildings which testify its former heyday. At that time many rich people were living there. Some famous buildings include Kurhaus, Hessian State Theatre and Town Hall etc. Streets and squares are inviting with a great selections of bars, restaurants and shops. Wiesbaden is also famous for its thermal springs and spa. In the history there were altogether 26 hot springs. Today 14 springs are still flowing. And, the Wiesbaden Casico (Spielbank) is also worth to visit. One of the city’s most popular leisure destination is the Nerobergbahn (Neroberg Mountain Train). It is an unique engineering site. The train is powered by water. Take a ride with Nerobergbahn up the hill you will have a breath-taking view of the Wiesbaden city. The best way to get there is to take S8 or ICE from Airport. The journey takes about 35 to 42 minutes. The driving time is around 20 minutes via A3 and the distance is about 27 kilometres from Frankfurt International Airport. The Castle Frankenstein is now in ruins, with only two towers, a restaurant and a chapel remaining. The hill top castle is in the middle of Odenwald. 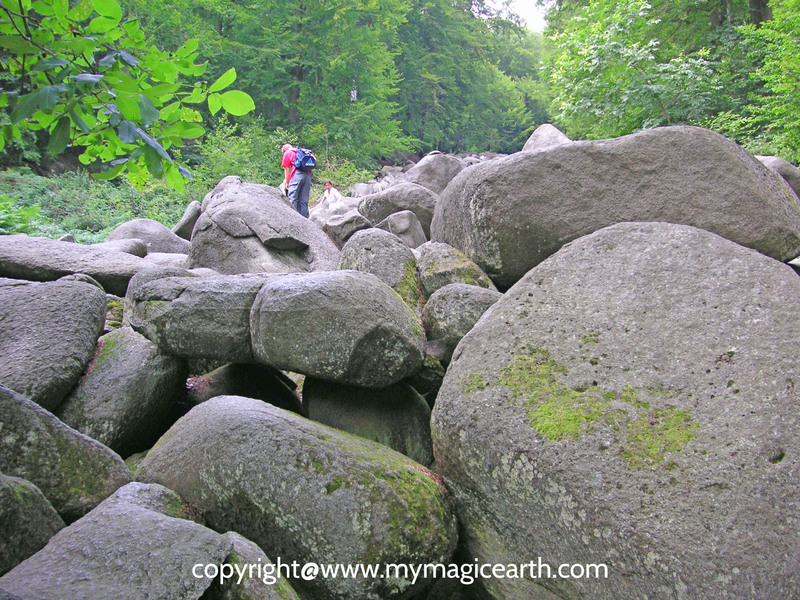 You can combine the visit with other places in the area, such as Felsenmeer, Darmstadt etc. The best way to get there is by car. The driving time is around 28 minutes via A5 and the distance is about 36 kilometres from Frankfurt International Airport. This is a vibrant city in which some big companies like Merk, the European Space Operations Centre, Deutsch Telekom as well as a famous Darmstadt University locate. One of the attraction is the Waldspirale (wooded spiral) designed by Hundertwasser. The Waldspirale present a loud testament to Hundertwasser’s hatred of straight lines. The large spiraled building has 105 apartments and more than 1000 windows. Not one of these windows has the same shaped and many have “tree tenants” growing right through them. The landmark of Darmstadt is the holistic building artwork of Mathildenhöhe, a hill top open museum. The magnificent artists’ houses from the period of Art Nouveau give this museum hill its unique flair. There are many museums which are worth to visit. The Eisenbahn Museum located in Darmstadt-Kranichstein has over 40 locomotives and more than 150 carriages in its collection. If you a locomotive fan then you should add to your list. The best way to get there is by car. The driving time is around 23 minutes via A5 and the distance is about 27 kilometres from Frankfurt International Airport. Located in the heart of the Odenwald nature park the beautiful historic city of Michelstadt is also among the top day trips from Frankfurt. To visit the old part takes around one hour to three hours. Cobbled streets, unique half-timbered houses and shops fill up the old town centre. Next to many sightseeings there are different festivals all over the year. The best way to get there is by car. The driving time is around 54 minutes via A3/B45 and the distance is about 74 kilometres from Frankfurt International Airport. There are many hiking and cycling routes in Oldenwald area. Several routes are just linked to the amazing Felsenmeer. The German word “Felsen” means rocks and “Meer” means “sea”. It refers to a large area of special rocks flowing from the hillside down to the valley. You can call it “Sea of Rocks” in English, but I think it sounds weird. I just call the giant rocks or boulders. It is not only a geographical site but also an adventure hiking destination. Special for kids this is an open gym. It can be one of the day trips from Frankfurt in summer time. The best way to get there is by car. The driving time is around 43 minutes via A5 and the distance is about 50 kilometres from Frankfurt International Airport. Miltenberg used to be the favourate location along the old trading route between Nuremberg and Frankfurt. Its Old Market Place known as „Schnatterloch“, the „Gasthaus zum Riesen“ (The Giant) which is Germany’s oldest royal inn and the oldest part of the town „Schwarzviertel” (Black Quarter) are worth to see. The Miltenberg castle used to be habitable but now is a museum which opens to the public. The best way to get there is by car. The driving time is around 50 minutes via A3/B469 and the distance is about 77 kilometres from Frankfurt International Airport. Heidelberg is located at the bank of Neckar river. Visitors can take the funicular up to the landmark – the Heidelberg castle ruins and stroll around the castle garden. Standing on the famous Old Bridge (Alte Brücke) you can have views to both side of the Neckar river. What I like the most is the Schlangenweg” (Winding Path) at the end of Old Bridge opposite the Old Town. It cuts steeply through terraced vineyards until it reaches the Philosophenweg. Along the way you can have views of the Neckar river and the Heidelberg old town. The best way to get there is by car. The driving time is around 49 minutes via A5 and the distance is about 80 kilometres from Frankfurt International Airport. If you don’t want to spend time for arranging a visit to Heidelberg, you can book a tour as well. There are tours available starting from Frankfurt. Heppenheim features impressive half-timbered buildings in the old town area (Altstadt). The Marktplatz is situated at the top of hill. Many half-timbered houses on the hill side are occupied by local residents. Unlike in other German towns, most part of the Altstadt is a residential area with several restaurants but almost no shops. The best way to get there is by car. The driving time is around 36 minutes via A5 and the distance is about 53 kilometres from Frankfurt International Airport. Yearly around the castle there are some special events such as medieval fair or a magic how. Inside castle visitors can climb up the tower to have a breathtaking view of the surrounding beautiful farms and green fields. The castle has a 90 meter deep well where one can throw water and hear the sound few seconds later. To experience a medieval atmosphere you can also book a themed meal, for example “Ritteressen“. 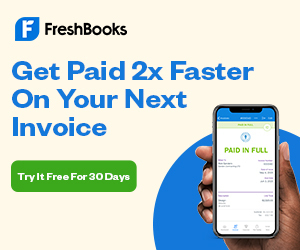 You have to book it ahead. The best way to get there is by car. The driving time is around 32 minutes via A3 and the distance is about 46 kilometres from Frankfurt International Airport. Steinau is a small town for friends of Grimm and fairy tales where they can see, hear and feel the tales the life, work and the world-renowned fairy tales of the Brothers Grimm. The cultural highlight of every year in autumn is the festival “Steinau Puppeteering Days”. The best way to get there is by car. The driving time is around 47 minutes via A3/A66 and the distance is about 78 kilometres from Frankfurt International Airport. The museum has many interesting displays: submarine, sea cruiser, Jumbo Jet, Space Shuttle Buran etc., everything from underwater to the space. Visitors can get into these machines to see how the inside looks like. It is the largest in the world of this kind. Just an hour south of Frankfurt, Spreyer is one of the best day trips from Frankfurt for old and young. The best way to get there is by car. The driving time is around 56 minutes via A67/A6 and the distance is about 93 kilometres from Frankfurt International Airport. The palace is famous for its beauty and the landscape architects of its gardens. The gardens include more than 100 sculptures and different type of buildings. The main sites are the Schwetzingen Castle and the Castle Theatre (Schlosstheatre). The best way to get there is by car. The driving time is around 47 minutes via A5/A67 and the distance is about 78 kilometres from Frankfurt International Airport. Found in 7th century, Wertheim is a medieval town with half-timbered houses and small streets. Burg Wertheim (Wertheim Castle) is the landmark of the town. But most international visitors come to Wertheim Village Outlet for shopping. While Frankfurt is not a shopping paradise, the Designer outlet in Wertheim is the real shopping destination near Frankfurt. It is home to more than 110 fashion and lifestyle boutiques from German and international brands. 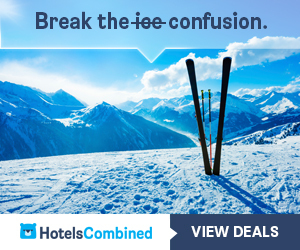 Each offers a huge discount on the recommended retail price all year round. The best way to get there is by car. The driving time is around 59minutes via A5/A67 and the distance is about 91 kilometres from Frankfurt International Airport. You can join one of the following tours to go there shopping. Oestrich-Winkel is a traditional wine town and is famous for its Riesling, which you usually find it on the wine list of a gourmet restaurant. The Oestricher Kran (Oestrich Crane) is the main landmark which is a former wine-loading crane from the 18th century for loading and unloading ships. The best way to get there is by car. The driving time is around 32 via A3/A66/B42 and the distance is about 45 kilometres from Frankfurt International Airport. I have made all these day trips from Frankfurt. Several places I have even visited many times. But I never get bored. It is hard to say if one place is better than the other. It depends on what you expect to see, what you like to do, how long you are going to spend, whom you travel with, what your interests are and millions other factors. Some of the places are quite close to each other that you can combine them into one day trip. Weinheim is just a short distance away from Heidelberg and Mannheim. It is on the German Bergstraße which crosses the southern Hesse and the northern Baden-Württemberg. It is a city with two castle, each offers stunning views to the surrounding valleys. You can hike up the castles, stroll around the old city centre, and have a meal in one of the many restaurants near the market square. Some really great day trips. I’ve done a few of them but thank you for the other inspiration. I travel alot to Frankfurt.